GOLD PRICES held $5 lower for the week so far on Tuesday morning in London, trading at $1313 per ounce as world stock markets rose at the start of the Chinese New Year of the Pig. Shares in Australia’s banking sector jumped after the Reserve Bank kept its key interest rate on hold at a record low of 1.5%. 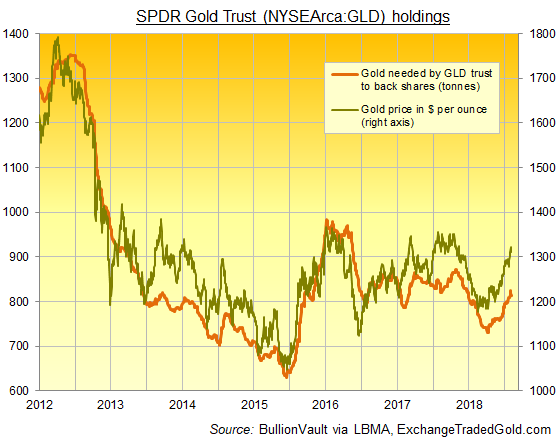 Among gold-backed ETF products, the giant SPDR Gold Trust (NYSEArca: GLD) ended last night with its fastest 2-session outflow since early September, shrinking 1.3% from Thursday’s finish as gold prices shed 0.8% from that new 8-month high of $1323 per ounce. While the gold price in Dollars has risen 10.5% since early October’s low, the GLD has expanded by 11.4%. “With Chinese investors [on Monday] enjoying their first day of the lunar New Year holiday,” says today’s trading note from Swiss refiners and finance group MKS Pamp’s Asian desk, “volumes through both spot and Comex were noticeably light. Despite the loss of wholesale demand from the world’s No.1 gold consumer nation however, gold prices have tended to perform well during China’s week-long Lunar New Year holidays. Compared with gold’s average 5-session change across the last 10 years of 0.1%, the week starting Chinese New Year’s Eve has on average seen a 1.8% gain for gold priced in US Dollar terms, ranging between a 1.8% drop (2018) to a 5.0% rise (2016). Eleven mints and refiners worldwide are today launching commemorative Chinese New Year of the Pig coins, reports the South China Morning Post, including the Central Bank of Taiwan – which began its zodiac series in 1993 – and Australia’s Perth Mint, which started its series in 1996. Forecasting a weaker US Dollar ahead, “The slowing…of the US economy, combined with Fed chair Jay Powell’s comments that he remains ‘patient’ have radically swung 2019 market pricing for the Fed Funds rate towards rate cuts,” says a note from analysts at Commonwealth Bank of Australia. The UK gold price in Pounds per ounce meantime touched £1010 for the first time since Friday lunchtime as Sterling hit 2-week lows on the FX market. Prime Minister Theresa May today met with politicians and business leaders in Northern Ireland to defend the “Irish backstop” part of her Brexit deal with the European Union, due to take effect 29 March but still lacking Parliamentary approval. Euro gold prices today held in line with last week’s finish at €1150, the highest Friday close for single-currency bullion traders since April 2017.